Hey gang, Valkor here. 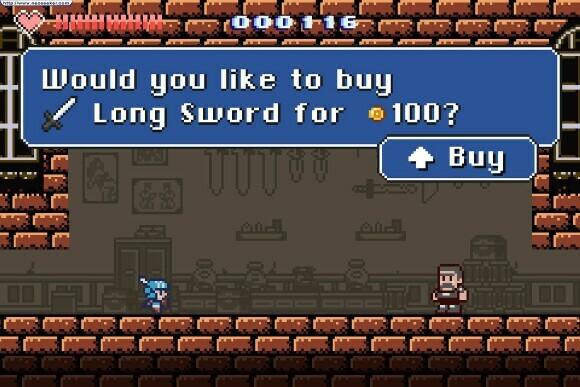 Indie games have finally found their place in gamedom and I’m proud that the gaming audience has fully accepted them. Sure some of them are hit or miss, some look well polished like a triple A title and some look pretty rough yet control great – and that’s what its all about: Control! 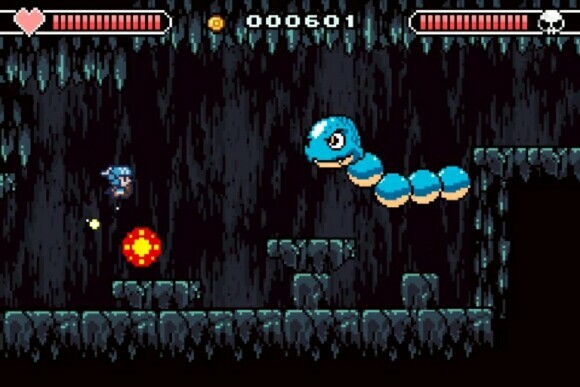 Take this next title from Nicalis that takes us back to the 8-Bit era with their latest title “Castle in the Darkness”. Some might pass on it because it looks “old school”, but you don't sleep on such a title because it’s pretty awesome. 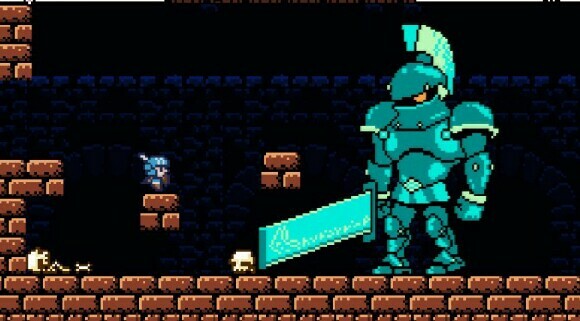 Castle in the Darkness is a 2D side-scroller that puts you in the role of a loyal knight who embarks on a journey to save the kingdom of Alexandria that has been overrun with monsters. On top of that, he has to rescue the princess who has been kidnapped. 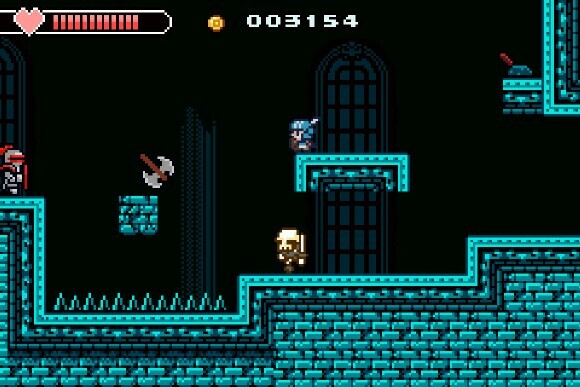 Castle in the Darkness is an action platformer with some RPG elements; you don’t gain experience when you kill an enemy but you do score some cash that can be used to upgrade your weapons and armor. You’ll also gain the ability to use magic. And believe me you’ll need whatever you find at your disposal; while the game doesn’t bum rush you with enemies and most you can simply kill and keep on moving; however there are some enemies that require work or some environments that take some skill getting past. And that’s one of the more interesting aspects of the game – you really have to take care when entering a new screen because if you’re too quick, you’ll slam into an enemy or unexpectedly run into a pit full of spikes. If you die, the game keeps track of your number of deaths – and you will die a lot (unless of course you have the mad skills). I’ve already hit the triple digit deaths thanks to this frost boss (ugh). Thankfully there are well placed checkpoints near important areas (like near boss battles) where you can not only heal up if you’re running low, but also save. The area of these checkpoints points are either good or bad; good if its near a boss but bad if you’re a few screens away. Then you’ll have to decide whether it’s a good idea to backtrack so you can save (important if you’ve snagged a key item) or keep going forward in hopes of running across a save. 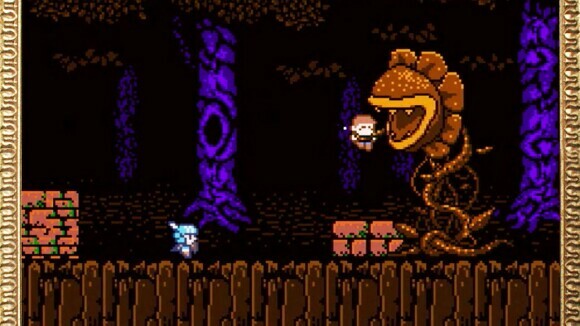 And that’s what's also interesting about Castle in the Darkness – it plays like an open world title similar to that of Symphony of the Night or Super Metroid; there are different paths you can take and some areas you cannot reach unless you have a key item or defeat a boss. A good example, earlier in the game you have to find the Clock Tower Key to access a particular area where there is a large chest but it’s location was nowhere near where I needed to use it. So exploring every corner you can reach is key. The best tip I can give to you guys is, once you obtain the Ares Gauntlet, try to keep a close watch of breakable walls. 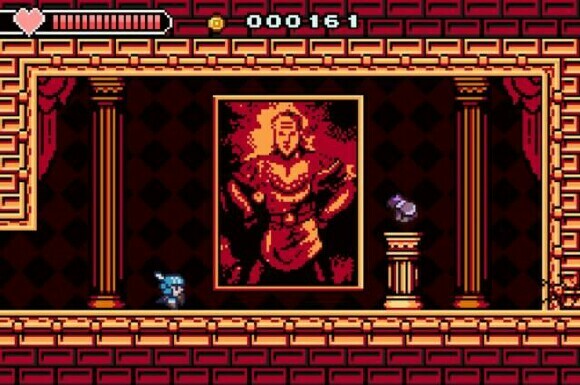 And speaking of Castlevania and Metroid, you’ll notice the obvious send up to both titles in Castle in the Darkness as the backdrops were clearly lifted from both series and other titles. Did I see the Viggo painting from Ghostbusters 2? Was that a giant Bubble Bobble dino I just fought? 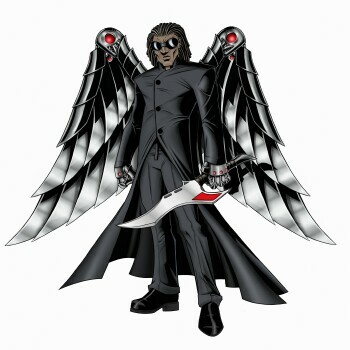 That flying demon… wasn’t that from Ghouls and Ghost? I have to say, I was impressed. Castle in the Darkness is one tough cookie, but it also plays fair enough that it won’t make you toss your controller with frustration. What’s important is that you really do need to take your time when entering a location (or face a deadly drop) or be cautious when you face a new enemy because you never know if, after one of those creatures dies, if it will reward you or try to kill you. In short: if you take your time, you'll get by. But if you rush you'll get crushed. The story is simple, quirky but fun, it doesn’t play out as often as I’d like but that just means more action – and there’s plenty of it to hold your interest. The controls are spot on perfect with really only two buttons to focus on and jumping, running and taking out baddies has never felt so right. The graphics look great with its retro 8-Bit look and even the music is a perfect match, which sounds just above 8-Bit but not exactly 16, yet it’s still sweet audio with some familiarity to it (did I hear a hint of Final Fantasy 1 at one point??). 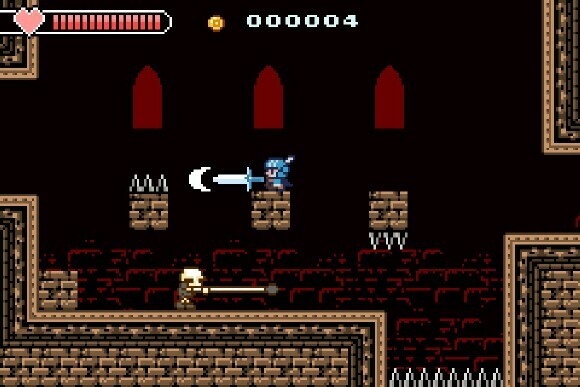 Even the sound effects are from familiar titles, especially from Symphony of the Night (no hate – it’s my favorite game). 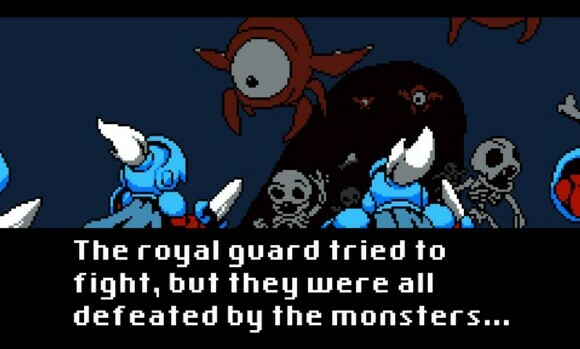 In the end, I had loads of fun with Castle in the Darkness, it can be frustrating and familiar but it’s definitely a lot of fun. It “might” make some folks with little patience toss the controller, but believe me it’s not terrible. My only wish is that it gets put on one of the handhelds – either the 3DS or the Vita… or both! Castle in the Darkness, in all of its Super Metroid/Castlevania/8-Bit throwback glory, is available now on STEAM. And if you have the patience then you’re in for a real treat. I’m still pushing my way through it and I won’t stop until I reach the very end. And out of TOV 5 stars, Castle in the Darkness gets a 4.5.